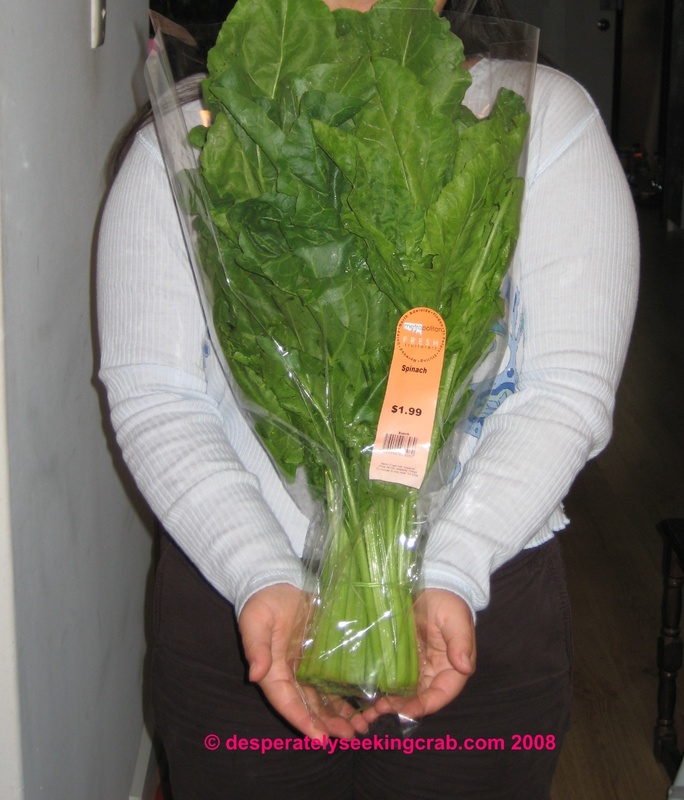 In North America, what we call “spinach” is something that is about a foot long, dark leafy green with fairly tender stems which also comes in the “baby” form. Imagine my surprise when I was at my local greengrocer and saw this gigantic bunch that I first mistook for flowers, then I thought it was kale. Hmm…it wasn’t even refrigerated but instead stacked up in neat rows like big floral bouquets and it wasn’t until I read the price sticker that I realized that it was indeed SPINACH! English Spinach to be exact and it was a bargain $1.99. I had to buy it and see if it tasted different and truly wanted to test how creative I could be with this beast. Now I know for many of you, that kind of mature spinach is no big deal and you probably grew up with it but for me, it was a great novelty because it was as if the spinach was on steroids. So I took it home and did cooked it in a slightly boring, yet yummy way – sauté it with olive oil, garlic, chili flakes, salt & pepper. But then, where do I store the half a ton of spinach I still had left? I knew that if I put it in my minuscule fridge that it would take it over completely and wilt it at the same time so I decided that my large crystal Royal Doulton water pitcher was the best place (like a vase) to store it. Amazingly enough, it stayed pretty fresh for about 3 days when I remembered that I still had it. I was simply too lazy to think of creative spinach recipes so I decided to make an Asian inspired soup which my husband didn’t really care for (which is surprising because he eats virtually anything). I was making braised pork belly (Asian-style w/soy sauce & 5-spice) and decided to boil the belly first in water and then cook it in the marinade. After skimming the scum off the liquid, I used the lightly pork-flavored broth for the base of my spinach soup (I love pork broth and it is definitely not done enough – more on that another time). I then chopped the rest of the lot of spinach into bite sized strips and some slivers of daikon, crushed garlic clove, 1 cm piece of sliced ginger, salt, pepper, chili flakes, sesame oil, and a hint of soy sauce. I thought that the soup was very flavorful and nutritious and fairly comforting especially since it’s starting to get a bit cooler outside. My husband on the other hand, being English, did not find the soup comforting…in fact I think he said that it tasted a bit like liquid dirt. A Pinot Noir probably would have complimented the earthy tones of the soup! (just kidding).